Rotate this 3D model of the skull to see that it is made up of 22 bones. The human skeleton has a number of functions, such as protection and supporting weight. 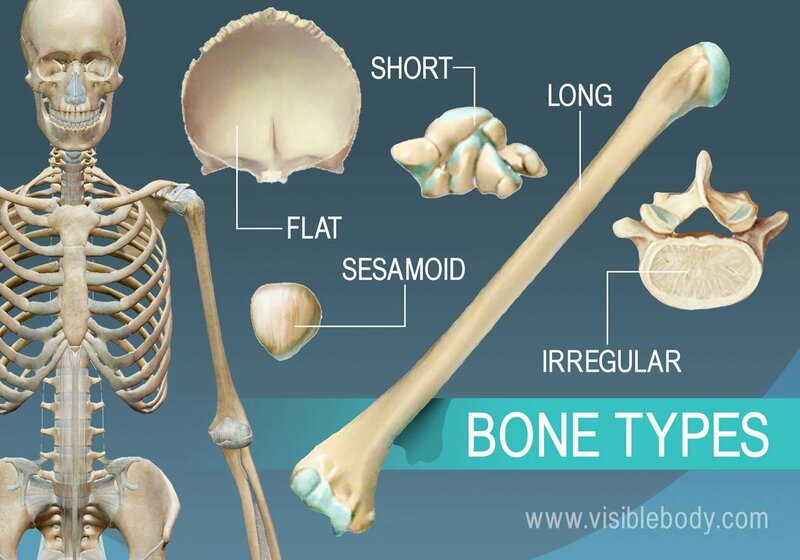 Different types of bones have differing shapes related to their particular function. So, what are the different types of bones? How are they categorized? There are five types of bones in the skeleton: flat, long, short, irregular, and sesamoid. Let’s go through each type and see examples. There are flat bones in the skull (occipital, parietal, frontal, nasal, lacrimal, and vomer), the thoracic cage (sternum and ribs), and the pelvis (ilium, ischium, and pubis). The function of flat bones is to protect internal organs such as the brain, heart, and pelvic organs. 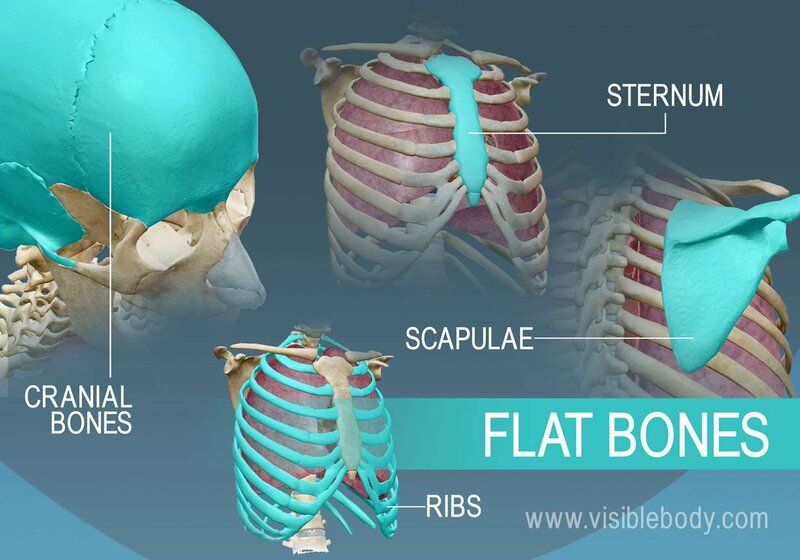 Flat bones are somewhat flattened, and can provide protection, like a shield; flat bones can also provide large areas of attachment for muscles. The long bones, longer than they are wide, include the femur (the longest bone in the body) as well as relatively small bones in the fingers. Long bones function to support the weight of the body and facilitate movement. 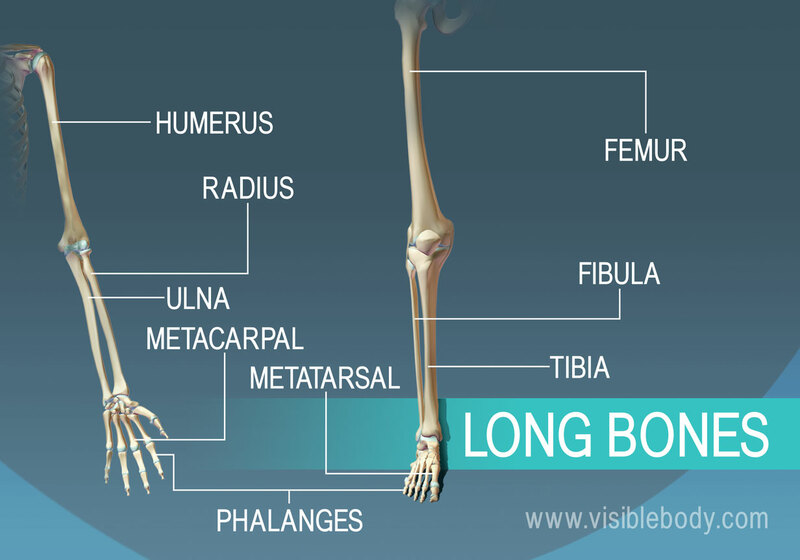 Long bones are mostly located in the appendicular skeleton and include bones in the lower limbs (the tibia, fibula, femur, metatarsals, and phalanges) and bones in the upper limbs (the humerus, radius, ulna, metacarpals, and phalanges). Short bones are about as long as they are wide. 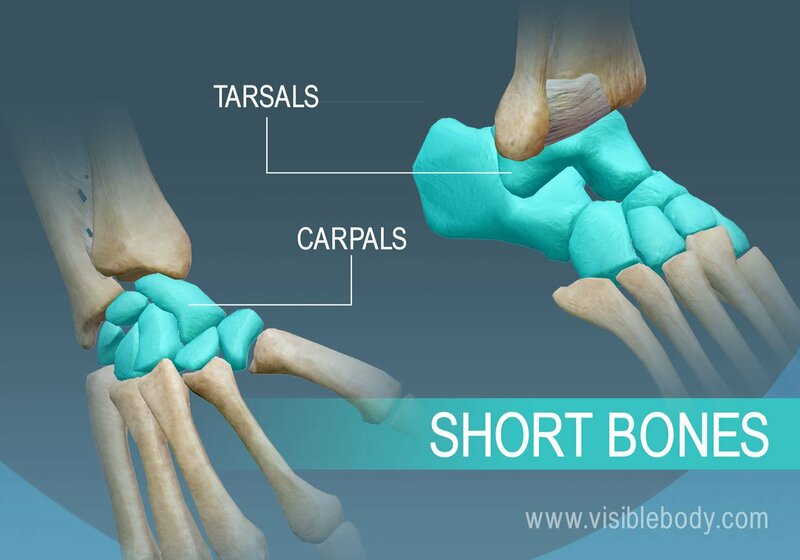 Located in the wrist and ankle joints, short bones provide stability and some movement. The carpals in the wrist (scaphoid, lunate, triquetral, hamate, pisiform, capitate, trapezoid, and trapezium) and the tarsals in the ankles (calcaneus, talus, navicular, cuboid, lateral cuneiform, intermediate cuneiform, and medial cuneiform) are examples of short bones. Irregular bones vary in shape and structure and therefore do not fit into any other category (flat, short, long, or sesamoid). They often have a fairly complex shape, which helps protect internal organs. 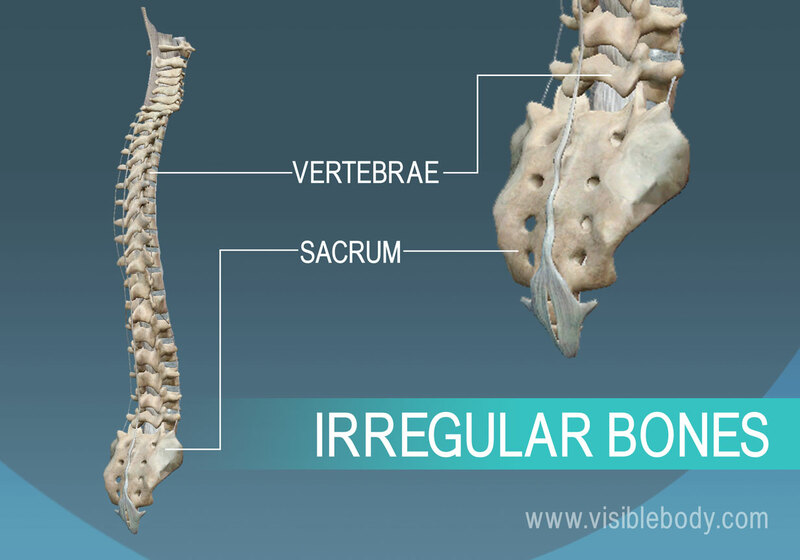 For example, the vertebrae, irregular bones of the vertebral column, protect the spinal cord. The irregular bones of the pelvis (pubis, ilium, and ischium) protect organs in the pelvic cavity. Sesamoid bones are bones embedded in tendons. These small, round bones are commonly found in the tendons of the hands, knees, and feet. Sesamoid bones function to protect tendons from stress and wear. 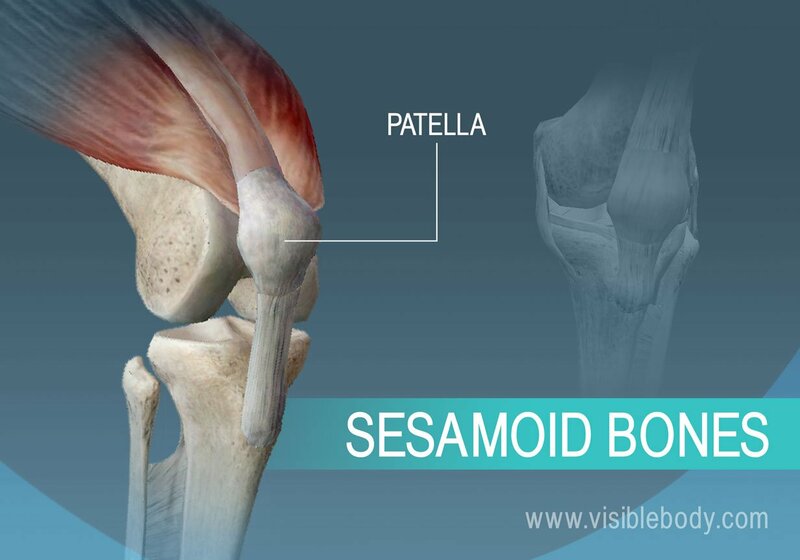 The patella, commonly referred to as the kneecap, is an example of a sesamoid bone. A description of types of bones from the 1918 edition of Gray's Anatomy of the Human Body.